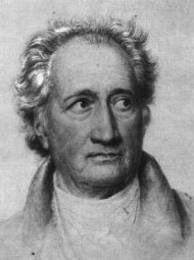 Johann Wolfgang von Goethe was a German writer and polymath. Goethe is considered by many to be the most important writer in the German language and one of the most important thinkers in Western culture. Goethe's works span the fields of poetry, drama, literature, theology, philosophy, and science. His magnum opus, lauded as one of the peaks of world literature, is the two-part drama Faust. Goethe's other well-known literary works include his numerous poems, the Bildungsroman Wilhelm Meister's Apprenticeship, and the epistolary novel The Sorrows of Young Werther. Goethe was one of the key figures of German literature and the movement of Weimar Classicism in the late 18th and early 19th centuries; this movement coincides with Enlightenment, Sentimentality (Empfindsamkeit), Sturm und Drang and Romanticism. The author of the scientific text Theory of Colours, his influential ideas on plant and animal morphology and homology were extended and developed by 19th century naturalists including Charles Darwin. He also served at length as the Privy Councilor of the duchy of Saxe-Weimar. Goethe is the originator of the concept of Weltliteratur ("world literature"), having taken great interest in the literatures of England, France, Italy, classical Greece, Persia, the Arab world, and others. His influence on German philosophy is immeasurable, having major effect especially on the generation of Hegel and Schelling, although Goethe himself refrained from practicing philosophy in the specialized sense. Goethe's influence spread across Europe, and for the next century his works were a major source of inspiration in music, drama, poetry and philosophy. Early in his career, however, he wondered whether painting might be his true vocation; late in his life, he expressed the expectation that he would ultimately be remembered above all for his work on colour. Everybody wants to be somebody. Nobody wants to grow.